It’s been a few months since we’ve heard from Air Force 1st Lt. Mark Graff. He’s serving with a Provincial Reconstruction Team(PRT) in Farah, Afghanistan. Graff, a new husband formerly based at MacDill Air Force Base, shared his thoughts and preparations prior to his first deployment. Just last week, Graff’s PRT team completed an “important mission” working villages that want peace and with Afghan National Army soldiers to destroy hundreds of confiscated Improved Explosive Devices (IEDs) and other unexploded mines, suicide vests, mortars, etc. FARAH, Afghanistan – Afghan National Army soldiers in Farah province worked with Provincial Reconstruction Team Farah and Explosive Ordnance Disposal Platoon 815 to hand over and dispose of more than 250 pieces of confiscated unexploded ordnance, improvised explosive device materials, mines and ammunition here Dec. 27. The weapons totaled more than 1300 pounds of explosive material and more than 50 types of ordnance. 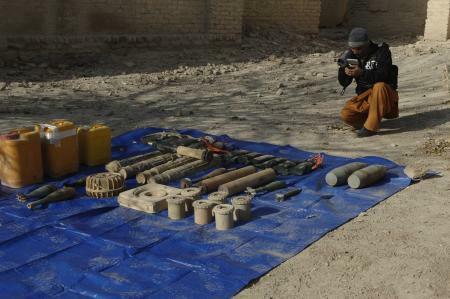 The items were carefully transported from a secure location in Farah City and safely destroyed by EOD technicians on Forward Operating Base Farah. “Most of these items were emplaced [as weapons]. The NDS got reports… and [we] came and got them,” said ANA Col. Abdul Razak, who organized the handover of the weapons. Graff’s full article and photographic gallery of the mission are available HERE.